These are the things that feed my soul. “Mommy can we please have a tea party?” my little four year old girl asks me. She leads me to her room where two tea cups sit on her play table. Sitting side by side, we just are, talking about whatever. We do this kind of thing quit often. Sometimes teddy bears join the two of us for tea. Time with my daughter warms up my soul like wool mittens do for my cold hands on a winter day. Leading me to the couch, my six year old son takes my hand and asks me to read him a story. We snuggle while we both enjoy the colorful pictures in a story book. We laugh at rhyming words that tickle our ears. We stop to ponder what might happen next before we turn the page. A child’s story with colorful illustrations, feeds my thirsty soul, just like a cold glass of water does on a hot summer day. On my comfy couch I like to sit with hot coffee and think. I take plenty of time sipping my favorite drink of the day as I study fish in their habitat. I quiet my soul and listen to the sound of clean water pouring out from the tank’s filters. Somehow this makes my mind clearer, just like the filters do with dirty water. My husband comes in with a bucket full of apples, a pot of fresh tomatoes, and a zucchini under his arm pit. My soul swells with gratitude when he hands me the fruit of his labor. It’s my husband who is the gardener with a green thumb. Every tiny seed he plants becomes our source of food. My husband loves to prosper and our garden is our pot of gold. Fresh produce shines with color and tastes better then butter. Eating organic food makes me feel whole. My soul is well when my belly is full. My fingers dance upon my key board creating words that come together in a story. Feelings, ideas, wants and needs are discovered as my story unfolds. My soul is well when I can express myself and so I write. My camera is my best friend. I click for fun. Every picture counts for something. My pictures help me remember. As I study my pictures I see everything that I missed when I was there. I print my pictures and my soul gets excited like a kid does at a candy store. Scrapbooking touches my creativity button while my soul fills with thanksgiving. All is well with my soul and I thank God for that. 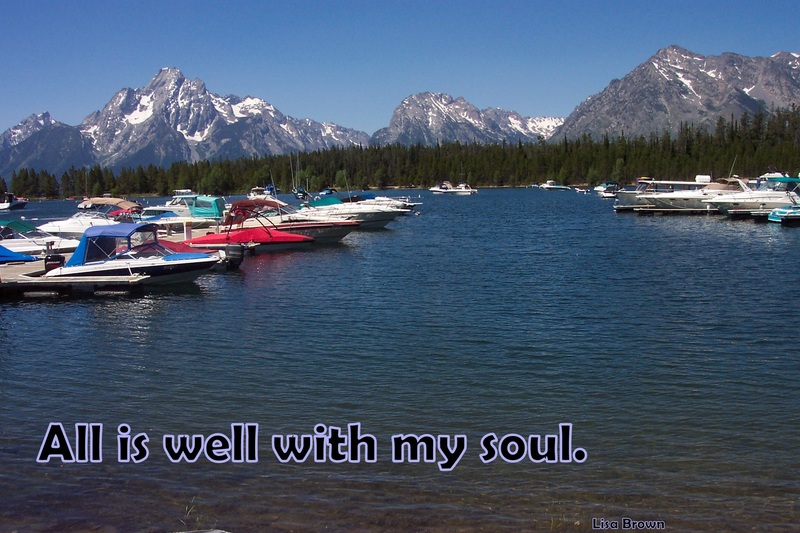 What do you like to do that feeds your soul? Thanks Liz and a thankful heart really does move dark clouds away!!! Thank you Heidi and hugs to you.